After their childhood friendship blossomed into love, one young couple's whirlwind romance ended in bitter disappointment. Now, years later, can a long-overdue Christmas gift heal two wounded hearts? A charming new governess is determined to create a magical Christmas for her young charges. What follows is a season of warmth, laughter, and even the promise of an unanticipated love. For generations, one small London bakery has carried on the sweet tradition of delivering bread to the impoverished. When the lovely baker meets a down-on-his luck stranger, her kindness will open the door to a bright friendship—and an astonishing discovery. After suffering a heartbreaking loss, one woman returns home to honor the family tradition of staging a Christmas celebration for the surrounding village. But when a severe snowstorm hinders her plans, help—and hope—find her in the most unexpected of ways. 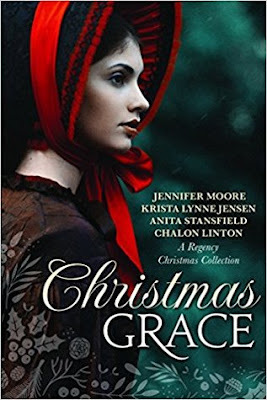 I absolutely loved this collection of heartfelt holiday stories set in Regency England! Each one had a perfectly sweet romance full of the hesitation and anticipation of unexpected love. I felt like it was easy to get to know the characters quickly and connect with them and whatever their struggle or heartache was. I loved watching the happy endings unfold for each of the couples in the stories and I loved the cozy feeling that the snowy Christmas setting brought. I honestly couldn't pick a favorite because I loved them all so well- that must be a good sign :) Highly recommend!!! Follow the blog tour . . .